Warning: Spoiler alert! There is story analysis that reveals key plot points below, proceed with caution. If there’s one misconception about Disney films that bothers me it’s the tonality myth of the happy ending. Firstly, A lot of people act as if this applies only to Disney films and wasn’t part of the Hollywood formula since time immemorial. More so that that, however, what Disney films have exemplified, especially under the stewardship of Walt himself, was that they were not fearful of putting kids through the emotional wringer because that ending was waiting – in many ways it becomes not about the the ending, but the journey. Now, I will acknowledge there is a lot of Disney fare that is light escapism, the iconic example of Pollyanna being one I’ve not yet seen. However, as I will demonstrate here, films by the company have frequently not been afraid to bring real life emotions and traumas into their stories and aren’t just fun and games. In Snow White not only is the witch frightening but we believe Snow White will be unconscious until her eventual demise. The Pleasure Island sequence in Pinocchio is fairly shocking to a young child. The treatment of Dumbo’s mother and her imprisonment, when she’s labeled as mad is rather brutal, and wrenches much emotion from the story. Sleeping Beauty is the first Disney title that comes to mind with any bloodshed, as minimal as it is. Bambi’s mother is quickly, shockingly and almost unceremoniously, killed. A more visually realized death is that of Mustafa in the Lion King. Old Yeller has to be put down. And if you’re saying, OK, what about endings? I’d propose Pocahontas without going into too much detail and spoiling it. It may not be a tragic finish, but it’s certainly not a “they lived happily ever after” one either. And in terms of shorts you can look upon The Little Matchgirl as bittersweet at best. Not only is that a beautifully rendered tale, but it does treat an Andersen tale with a pathos closer to the original than The Little Mermaid did. With these more recent titles, however, I feel there is a sort of return to that notion that Disney always implied, if he didn’t say outright. Bridge to Terabithia in some ways I feel suffered critically, and perhaps financially too, due to the known plot point of Leslie’s death. It reminds me of the debate that surrounded My Girl. Thomas J’s death was seen as a detriment to the film by some, but in essence that’s part of what makes the film what it is. You can argue the merits of killing a child character but its functionality within the plot is really what determines how well the film works. Similarly, with last year’s Brave, you can dislike what the major reveal was, but the story was built to go there, its how it operated and functioned from that point on that matters. With Terabithia the chronicle really is about Jess (Josh Hutcherson), and the fact that both he and Leslie carry a film that does wander into more serious territory was rewarded with several BAM nominations. The story is told through Jess’s eyes. It’s his coming-of-age that is being told. He has a skill (drawing) that some look upon and scoff at; he’s the one who has to come to terms with his own personality, to follow his dreams even though he’s called a dreamer; to embrace his imagination as a gift rather than a burden. Leslie is the catalyst to him doing those things. She creates an elaborate fantasy world that they share. Jess losing her is the ultimate test of if he can accept himself as he is. Can he forgive himself or will he blame himself? Can he draw again? 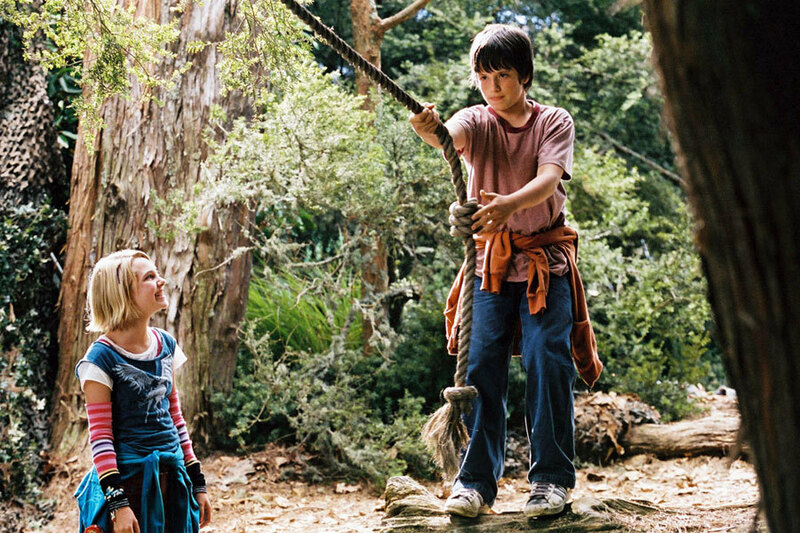 Will he “return to Terabithia” anew now that he lost his traveling companion? The end of the film is a redemptive one, but it’s not one I would call happy because of all that came before it. As for Timothy Green, this was an oft-overlooked, far too misunderstood film last year. As Roger Ebert stated very well in his review, the fact that Timothy’s fairytale like appearance is left a mystery and never logically explained is a boon to the story not a burden. As magically as he appears, you can tell that his time will be limited, there is a foreboding even at the most wondrous times he shares with his temporary parents that is apparent in the film, even if you didn’t infer it from the title. His departure is heart-wrenching and perfectly portrayed by CJ Adams, Jennifer Garner and Joel Edgerton, and the way it’s portrayed visually is even better. Yes, the young couple in the end does get what they want. They still have the wonderful memories they shared with Timothy, but they also still bear the hurt of having known him for such a short time and having lost him. And if you think about it there are two deaths in that film. No, you won’t always get the deepest, most intellectual treatment of every subject in a Disney film, but don’t go just based on a handful of titles and take in the totality of the entire film and not just the ending. Yes, even Disney films can feature real hurt, pain and emotions, and those that do are usually among the best.